In recent months, the Editor of this blog has worked with Zack Hinden of The Atlantic, providing historical insight and original data. 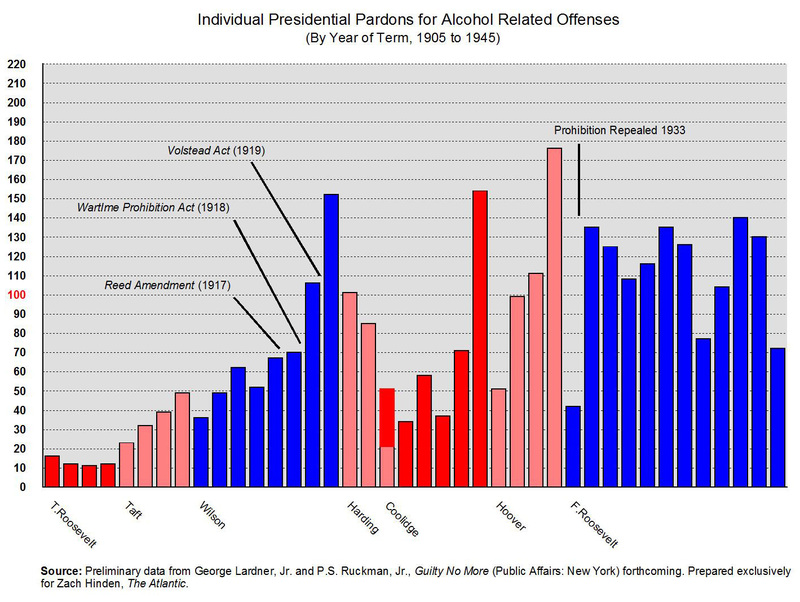 Hinden's curiosity was how presidential use of pardons in the era of Prohibition, and the immediate post-Prohibition era, might be analogous to pardoning in an era when public attitudes about marijuana are changing and decriminalization is a growing trend in the states. Here are some excerpts from Hinden's fine effort. You can read the entire piece here. The precedents are clear. When an executive believes that the letter of the law runs counter to the public interest, it’s his prerogative to pardon. Consider, for instance, the amnesties granted to tax-resisting Whiskey Rebels by Washington and Adams, to aliens and seditionists by Jefferson, to pirates by Madison, to Confederate soldiers by Johnson, to draft-dodgers by Carter—or, in effect, to 4.3 million undocumented immigrants last November, by President Obama. Just as that decision pressed Congress and state legislatures to come around on immigration, amnesty for marijuana offenders would send a reality check—to governors who wield their own pardon power, to police and judges, as well as to employers, landlords, and college admissions committees—that most Americans don’t believe marijuana-use needs punishing, and that there’s justice in forgiveness.